Again this year there will be a 50 mile ultra and a 25 km (~16 mile) trail race. 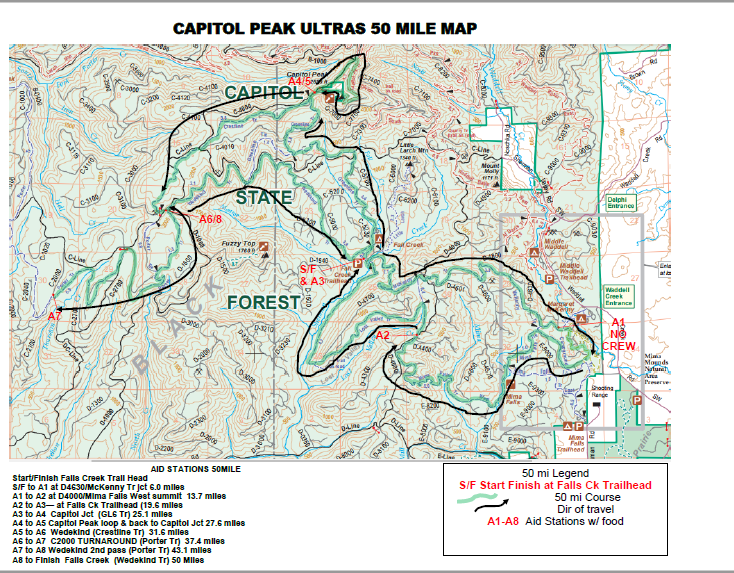 2019 will mark the 15th year of the Capitol Peak races in Capitol Forest. The peak is open! Down below you’ll see what we are planning for 2019. Both the 50-mile and 25 K start from Falls Creek trailhead. Start time for the 50-mile is 6:00am, 25K is 9:00am. Cut-offs for the 50miler will be 1:30pm at mile 25 and 5:30pm at mile 42. PLEASE NOTE: There is camping at the Falls Creek Campground, near the start. Friday night only. There is no registration for camping, but you will need a Discover Pass to camp. Please let me know if you are planning on camping. 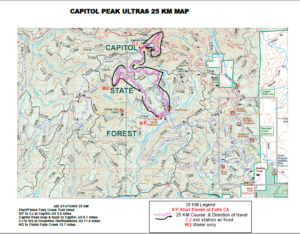 “Capitol Forest is a “working forest”, so course revisions are possible to accommodate the “work”. For updates please check here. Both the 50-mile and 25K start and finish from Falls Creek Trailhead. The race will feature some of the most rugged and serene single track trails and grinding sections of gravel road, and, depending on toss-of-the-coin for weather in April, spectacular views. With 2,730 feet of elevation gain in the 25 K, and over 6700 feet of elevation gain in the 50-mile, you will work to earn your finish. From Delphi road, turn West on Waddle Creek Rd, turn right on Sherman Valley rd, follow up into the forest, turn left at the Fall Creek sign, drive past the Fall Creek Campground turnoff to the Fall Creek Day Use Area. You will may have to park on the shoulder of the road or in the campground. Hang your Discover Pass or get a ticket! 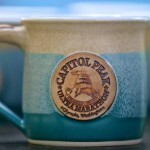 We will have a Free training run for 25K racers on April 13th. Starting at 9am at the Fall Creek Day Use Area. 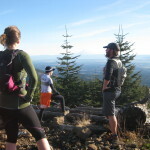 Come try out the course with experienced trail runners. Each run will be 8 – 9 miles. Registrants will be emailed the details. Age group winners for the 50Miler and 25K will receive a custom coffee mug made by Owen Dearing of Mug Evolution in Bend Oregon.